I was going through some pictures from earlier this summer...and I was happy come across some of my super handsome nephew, Luke, so just had to share. You may not be able to see it in the photos, but he has a John Travolta chin-dimple. It is so cute, I just love it. In 15 years, the girls are going to be all over this guy...I can just tell. 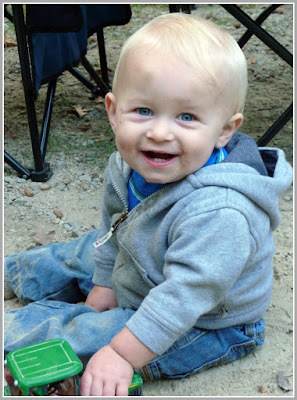 You see, these photos are from when we went camping for the weekend. And everywhere he goes...tractors follow. 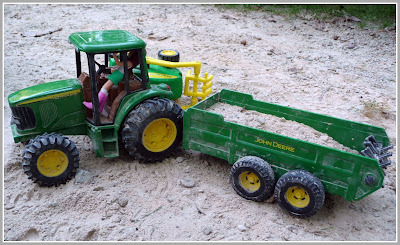 I mean, really, how would we have moved all that sand if it wasn't for his John Deere rig? 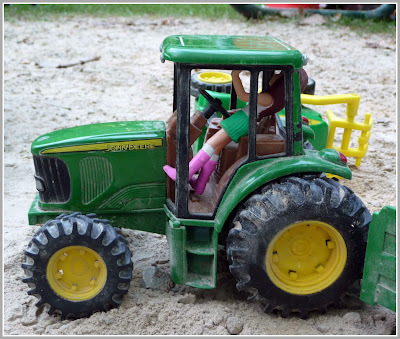 But then I looked a little closer...and realized my all-american-iowa-farmboy-nephew with the big blue eyes and lady-killer chin dimple has a love for something other than green tractors...do you see it?? 17 months old...and he already likes the ladies with long legs, pink go-go boots and a mini-skirt. Maybe this is from some really bad country song he overheard. I hear their minds are like sponges at this age. Ugh. They grow up waaaaay to fast. He is wayy to handsome!!! You need one of your own so we can have playdates ;) By the way an idea for your next post.. Recipe for your famous BBQ Turkey Panini.. I was too tired last night to make one so maybe today for lunch..